Frustrated with a mess of a/v components, tapes, DVDs and miscellanea, I needed an entertainment center to fit my needs. 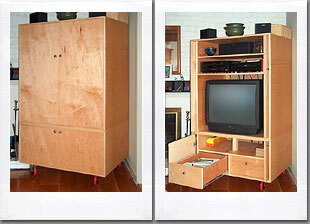 Unable to find one to my specifications that cost less than $2000, I designed my own and built it for less than $500. It's made of all 3/4" hard maple plywood and maple trim. It's finished with hand-rubbed tung oil and brushed stainless hardware. The doors when opened hide completely into pockets.